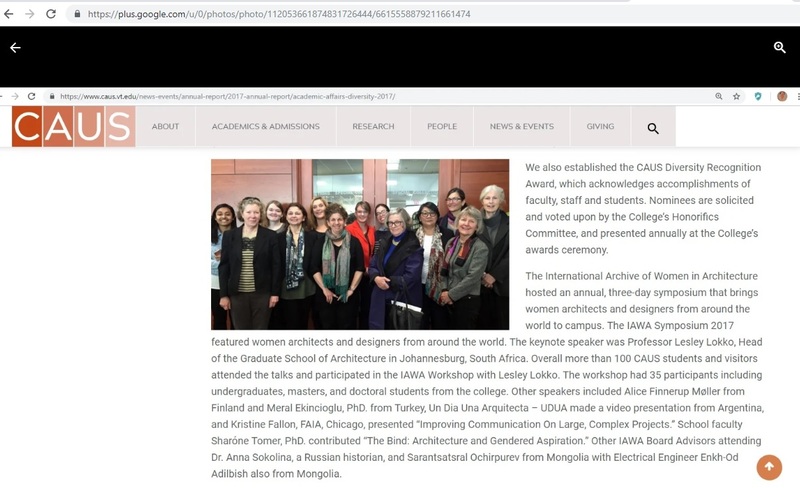 I would like to express my thanks to all organizers of the IAWA Symposium for giving me the opportunity to meet so many brilliant women architects from various cultures and geographies, and to talk about the findings of my recent academic research project, “historical recognition of Turkish women architects of the postwar generation in the U.S.” which I conducted at the Massachusetts Institute of Technology, History, Theory and Criticism of Architecture Program. (2014-2016) on March 24th 2017. The symposium organized on March 23rd-24th and the International Archive of Women in Architecture (IAWA) were very stimulating and informative for me. In my life, I have never seen such a comprehensive archive on women in “global” architecture, really admired their endeavor and “inclusive” approach. 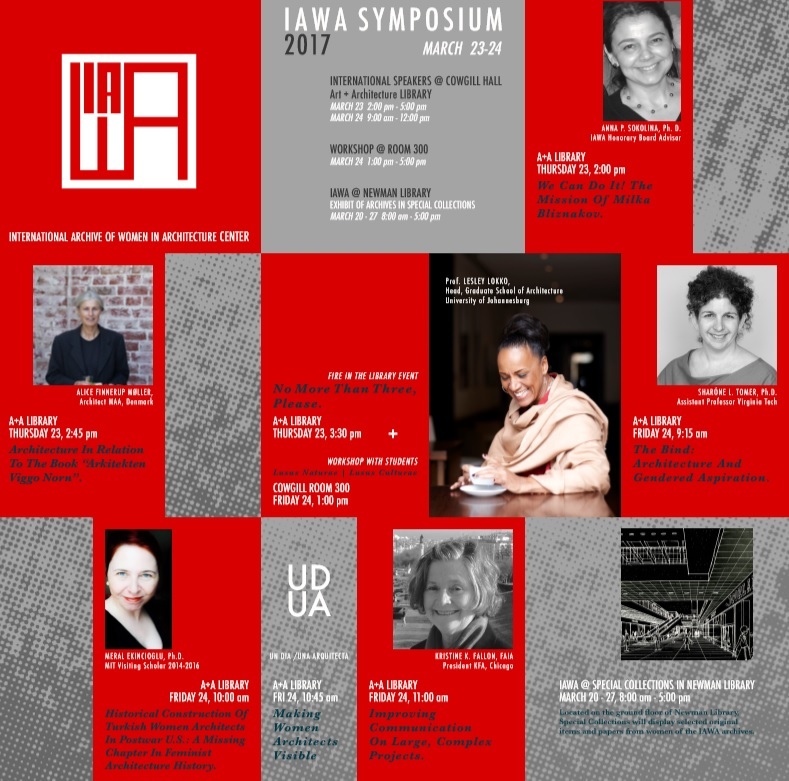 Established in 1985, the International Archive of Women in Architecture (IAWA), a joint program of the College of Architecture and Urban Studies and the University Libraries at Virginia Tech aims to document women’s contributions to the architecture profession, practice and discipline. As they express on their official webpage, “the IAWA represents about 2000 cubic feet, divided into around 450 collections. This includes roughly 150 significant manuscript collections (primary source materials that have not been previously published) which document the legacies of individual women architects, practices, organizations, and major exhibitions. Additional resources include approximately 300 smaller research and reference collections, which comprise biographical materials, previously published sources, and a small amount of unpublished primary sources for many other women and women's associations. The IAWA features women from nearly 40 countries, with materials written in at least 17 languages.” (http://spec.lib.vt.edu/IAWA, accessed on April 2nd 2017). In addition, the center has just announced “its digital project” in order to share its archival materials with everyone around the world. According to their official webpage, “with the support of a $232,356 grant from the Council on Library and Information Resources (CLIR), the University Libraries at Virginia Tech will digitize and document a significant part of the collection, making the work of 30 women architects freely accessible to the world in an online repository.” (https://vtnews.vt.edu/articles/2017/03/univlib-women-of-design.html, accessed on April 2nd, 2017). I believe that the symposium was well timed to emphasize the potential of women and gender in global architecture and hope that its messages could create new awareness in the profession, academia, scholarship and documentation in this field. Located on the ground floor of Newman Library, Special Collections displayed selected original items and papers from women of the IAWA archives. The poster, the International Archive of Women in Architecture Symposium, Virgina Tech., 2017. My presentation at the symposium, 2017. Architectural design studio, Virginia Tech., March, 2017, photo: M. Ekincioglu. Reference: Allbright, K. C., AIA, Associate Dean for Academic Affairs and Professor of Architecture, CAUS Academic Affairs overview, https://www.caus.vt.edu/news-events/annual-report/2017-annual-report/academic-affairs-diversity-2017, accessed on 10.15.2018.